E2276 RC Aircraft Light Controller | Locus Engineering Inc. The E2276 R/C Aircraft Light Controller adds realistic aircraft navigation and landing lights to your R/C aircraft. 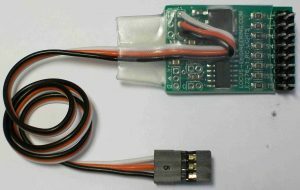 Powered from a standard 5V to 12V receiver, both position and strobed navigation lights are powered through current limiting resistors matched to the red, green, and white LEDs for 20mA. The landing lights are run from the gear channel while the navigation lights run continuously. The lights are enabled at the servo pulse halfway point and feature jitter free switching due to a 10ms hysterisis deadband. LEDs are easily connected to the 0.1” pitch paired male pins on the board periphery. Custom light timing is available. LED cables are available separately at custom lengths.